Zoom offers the first Unified Meeting Experience, a cloud service that provides a 3-in-1 meeting platform with HD video conferencing, mobility and web meetings. Unified Meeting Experience also offers the first available mobile-screen sharing, an innovative hybrid cloud service and works across desktop, tablet, mobile and room systems. Learn more about Zoom by visiting http://zoom.us. This is a REVIEW for educators of the Tablet Stage by Belkin as well as the "Stage" app. The Belkin Tablet Stage is a modern version of a document camera - it holds tablets measuring 7 - 11 inches and allows for access to ports if you need to hard-wire your tablet to a projector cable. Details about the Tablet Stage are below. This is NOT a sponsored video. Video about a student with Autism that wants others to understand him. This video was part of a class project in which students were asked to tell a story. Michael wanted to convey to his classmates what his life is like as a person with autism, and with the help of one of his teachers, John Lozano, he used images and video to tell his story, an effort that took almost seven months. Michael decided the kinds of pictures and footage and directed Mr. Lozano how it should come together. The music in this video is “untitled,” by Kina Grannis. It isn’t that the song has no title; “untitled” is its name, and is from one of her first albums. Mr. Lozano would sometimes play Grannis’s songs during class, and Michael felt that though the song has no lyrics, the melody was able to help tell his story. For more than a quarter century, Saroo Brierley searched for his family before finding his way back home with the help of #GoogleEarth. Watch the incredible true story of hope, determination and technology. Here is a salute to fifteen amazing Michigan educators whose contribution to my personal learning network have allowed me to learn all that I have and keep me going in my daily teaching life. Think of it as a video version of the Twitter #FollowFriday hashtag. The Common Core State Standards are a set of benchmarks for each grade. They close the gap between what you need to know to graduate from high school and what you need to know for college or work. They're rationally designed, so students learn concepts in a logical order. And they emphasize learning fewer subjects more deeply. Help me design the School in the Cloud, a learning lab in India, where children can explore and learn from each other -- using resources and mentoring from the cloud. Hear his inspiring vision for Self Organized Learning Environments (SOLE), and learn more at tedprize.org. 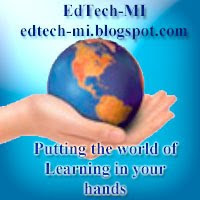 MACUL conference and Ruckus break new records. Ruckus connects more then 4600 users devices to the MACUL conference. Ruckus stands the test, if you are looking for a wireless system you need to look at Ruckus. Use quizlet to learn anything! Does this sound familiar in k12 schools.